LTS irrigation designers know that in Golf Course Irrigation design each system is unique and should be designed with particular emphasis on climate, grading, drainage, water recovery rates, pumping requirements, electricity and most importantly ECONOMICS. As Professional Irrigation Consultants, we can ensure that the irrigation components we specify for your GOLF COURSE are efficient in the delivery and distribution of water, By carefully selecting system components we can minimize the pressure requirements and operating cost of the pumping plant. Efficiency and Water conservation have always been an integral part of the design process at LTS, because we know they both have a direct affect on the operating cost of the irrigation system. Operation savings include lower power costs, lower water cost and lower equipment cost. Long term operation savings are possible because each LTS system is designed to operate efficiently at lower pressures which translates into lower repair and maintenance cost. 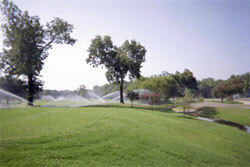 Our philosophy of using sound irrigation design principles and EXCELLENCE in GOLF COURSE IRRIGATION. COMPUTERIZED EVALUATION OF PIPING SYSTEM, PUMPING SYSTEM, IRRIGATION EQUIPMENT, HYDRAULIC ANALYSIS. PREPARING COMPUTERIZED PROGRAM SCHEDULING AND IRRIGATION SYSTEM UPGRADE.